I arose early to another grey, overcast morning. Packed my Dew-damp tent and hit the trail just after 6:30am. It was just eight miles to the KOA and I was motivated to make good time and arrived before 9:30am. 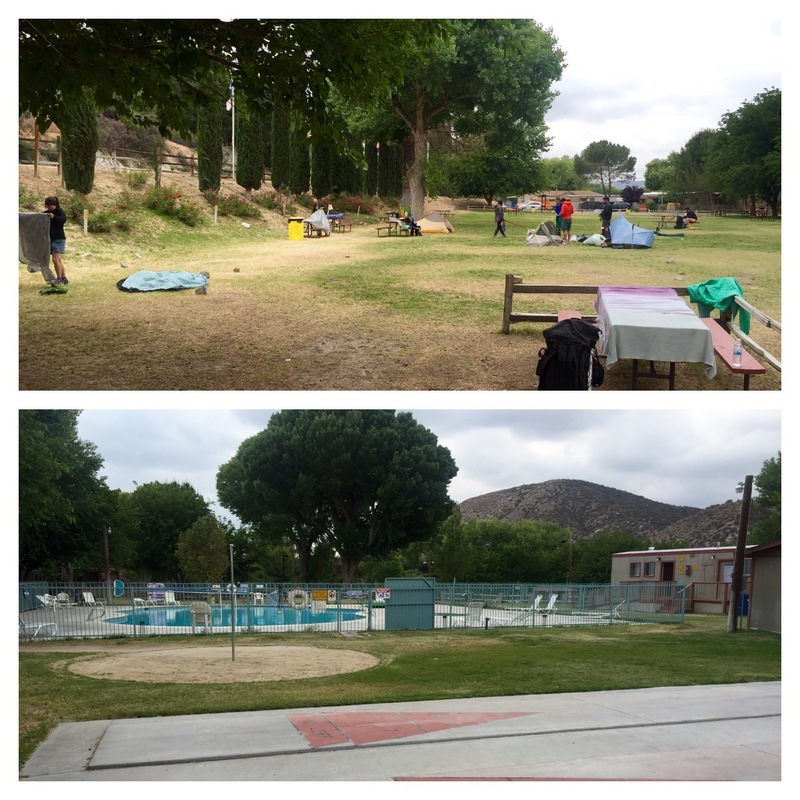 Overall, it’s a real nice KOA; They have Showers, Laundry, Pool and Hot Tub. However, it’s still overcast and cold, so no pool or spa. 😣 But that shower was wonderful. 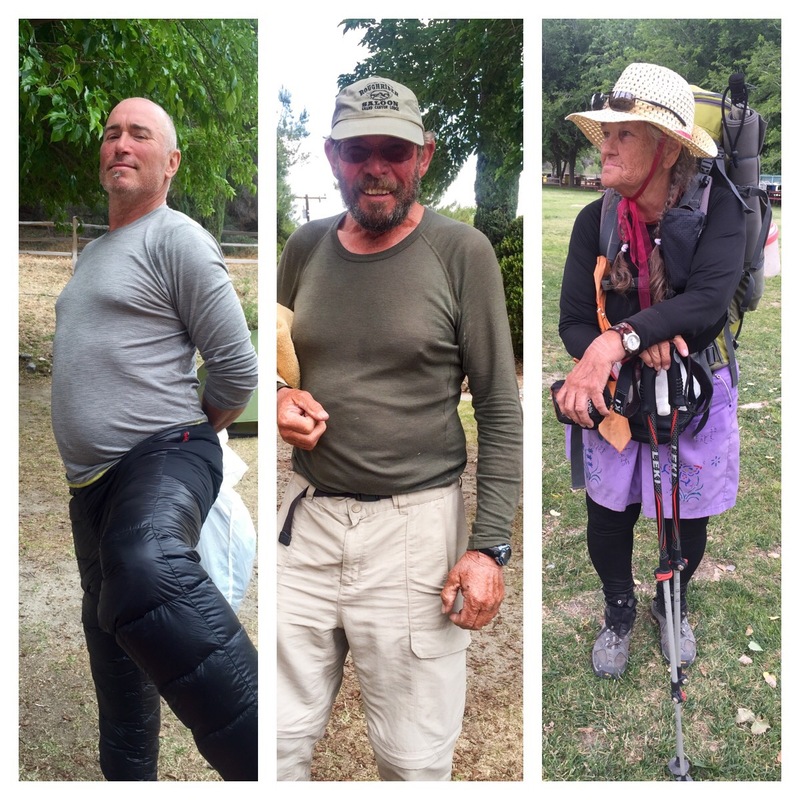 My sister will be here in the late afternoon, so I’m kicking back with my hiker buddies: Robert (Left) and Turtle (center), who are my age and Mother Goose. (Who is older and tougher than I) I’m also finishing the last paperback I purchased in Wrightwood. I will be updating once I am on the trail again the end of the week. Sorry to hear about your feet issues. I went through 6 pairs of trail shoes. You only get 400 to 600 miles on the light weight trail shoes unless you got boots. You will see the Germans and Swiss hikers with heavy boots and they will put a few thousand miles on them and when the rubber wears out they have them resoled. Watch how they climb hills and use their poles, its amazing. My feet went from a 10.5 regular to a 13 e. Your feet expand three dimensionally and in most cases they will stay that way. I found that the Merrell Ventilators were the best. You will see them on a lot of hikers. They are a little more weight wise and they come in wider widths and have a rugged Vibrum sole and they will outlast the lighter weight trail shoes. You don’t want any water proof shoes with the Goretex lining. Eric the Black you lives in Big BEAR and publishes trail guides on the PCT, CDT and others got me turned on to these shoes. I used these on my long AT section hikes and they with stood the test. If you do get new shoes, make sure you get the inserts. There are a couple different brands Sole and Supper Feet. Both companies have them and they come in various thickness. Try all of them in you new shoes to see which ones feel the best before you buy a pair. Well good luck my friend and hope all goes well. You got a long ways to go. I have used boots in the for many years and liked them. It’s the stream crossing that decided I use trail runners. The Cascadias fit all the categories and the tread looked to last 400+ miles, which I could accept. Less than 200 with the uppers wearing out? No deal. I do use SuperFeet inserts. That’s why $140+$40 = $180/pair is killing me. (I replace the inserts with the shoes) we’ll just have to see what fits.